This may be the best chicken I ever made! I used a peculiar method of mixing two totally incompatible cooking techniques: roasting and braising. Crazy right? But it worked. And, it’s a One-Pot Chicken Dinner! Nothing is more satisfying than making a meal in one pot. A One-Pot Chicken Dinner is even better! Cooking the chicken on the bone with the skin on creates a very moist chicken. And using a herb butter mix and both under and over the skin of the chicken delivers outstanding flavor. 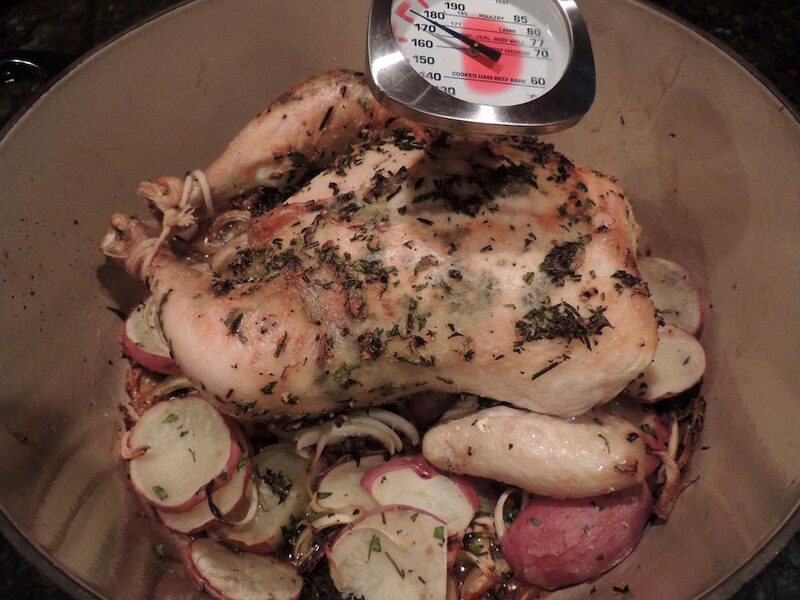 I’ve recently come across a few recipes for roasting a chicken in a heavy-duty pot such as a LeCreuset Dutch oven, which is an iron pan with an enamel coating. An excellent braising vehicle. The idea of using it to roast seemed a bit odd at first. Usually you want a roasting pan that has lower sides to allow the heat to reach the chicken and brown the skin. The problem with this method is that the breast is done before the thigh meat and continued cooking makes the breast meat dry. I thought I’d give this method a try and see what happens. My take is that it’s an “uncovered braise.” Leaving the cover off allows the top to get some color, but the cooking environment is still quite moist and the skin doesn’t crisp all over like a roasted chicken. However, the flavor and the moistness of the chicken is by far the best I’ve ever had! And, most importantly both the thigh meat and the breast are done at the same time. The intensity of the heat from the high sides of the pot accomplishes this beautifully and those high sides also keep moisture in the pot, preventing the chicken from drying out. A win win! I chose to use a lower cooking temperature than I saw in some recipes. I did start out at 475 degrees F for the first 20 minutes. The chicken gets a little color on the top and the pan heats up quickly. I then chose 300 degrees F for the cooking time vs. 350 degrees recommended in other recipes. This is more of the braise approach – low and slow. Add vegetables to this for a one-pot dinner. 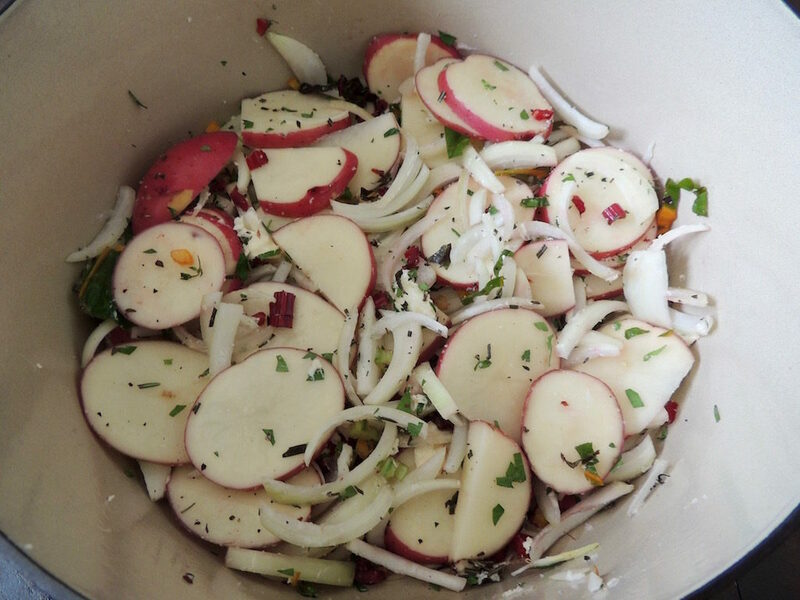 Start with onions and garlic as the base, some thinly sliced red potatoes and anything else you like. I included some chopped chard, both stems and leaves. Don’t forget some fresh herbs, such as rosemary, thyme and/or parsley, salt, and pepper. Rub a combination of melted butter, more of the herbs, garlic, lemon zest, salt and pepper under and over the skin and pop a quartered lemon into the cavity with a little salt and pepper. Cooking the chicken on top of the vegetables and letting all the flavors marry is a wonderful way to get dinner done in one pot. Check to make sure your potatoes are completely cooked. 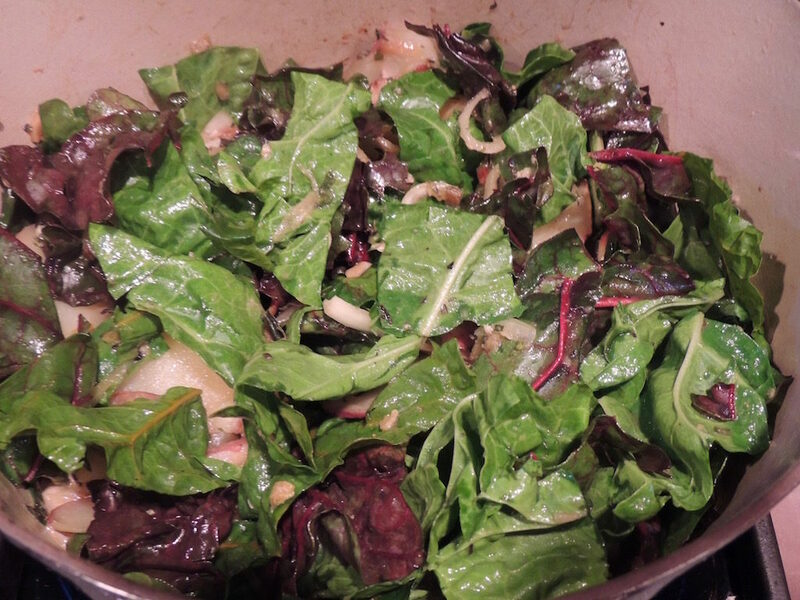 If not, finish on the stovetop while the chicken rests and then stir in the coarsely chopped chard leaves to wilt. Place the vegetables on a warm platter and top with the carved chicken. The entire recipe can be prepared in advance, just take it out of the refrigerator an hour or so before roasting to let the pan warm up or add 5-7 minutes to the initial cooking time. Nothing is more satisfying than making an entire meal in one pot. A One-Pot Chicken Dinner is even better! Cooking the chicken on the bone with the skin on creates a very moist chicken. 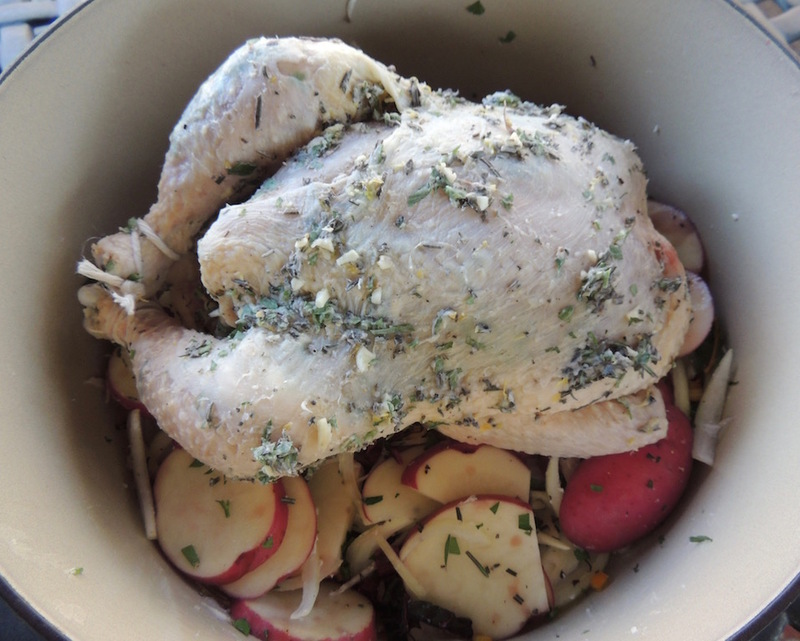 And using a herb butter mix and both under and over the skin of the chicken delivers great flavor. Wash the chard and separate the leaves from the stems. Trim the stem bottoms and mince. Roughly chop the leaves and save for later. Grease the bottom of the pan with the butter or pour in the oil. Add the chard stems, onion, potatoes, garlic, rosemary, thyme, parsley, salt and pepper. Toss to combine. Combine the melted butter, rosemary, thyme, parsley, garlic, lemon zest, salt and pepper. Lift up the skin and using one-half of the butter mixture rub all over each breast and on the legs and thighs. Rub the remaining butter on the outside of the chicken. Sprinkle the inside of the chicken with a little salt and pepper and stuff in the lemon quarters. Tie the legs and place on top of the vegetables. Place the chicken in the preheated oven and roast for 20 minutes. Reduce the heat to 300 degrees F and cook for another 25-30 minutes per pound. The internal temperature of the chicken should register 170 degrees F.
The recipe can be prepared in advance, just take it out of the refrigerator an hour or so before roasting to let the pan warm up or add 5-7 minutes to the initial cooking time.